JUDAS PRIEST‘s long-awaited new album contains “good energy” and “some real classic moments,” according to a producer who worked on the disc. 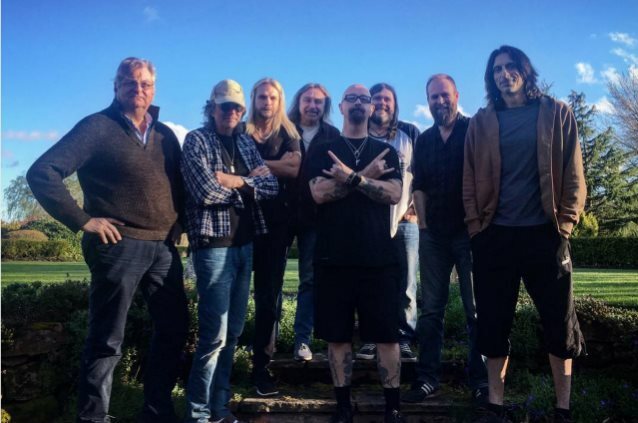 The follow-up to 2014’s “Redeemer Of Souls” was helmed by the band’s longtime collaborator Tom Allom, acclaimed British knob-twiddler Andy Sneap (MEGADETH, EXODUS, TESTAMENT, ACCEPT) and engineer Mike Exeter (BLACK SABBATH). Sneap, who plays guitar in the reactivated British occult metal act HELL, spoke about his involvement with the new PRIEST album during an interview with Serbia’s Hardwired magazine. Andy said (hear audio below): “When I first got involved with them, I think we had about twenty-six ideas that we were working on, which we’ve whittled down to fourteen or fifteen; we haven’t decided on a which songs or a running order for the album yet. “I think it’s got a really good energy and some real classic moments on there. Rob‘s [Halford] singing great, Richie‘s [Faulkner] on fire on it. “We really, really pushed the band to play together in the studio, and we actually took tempos from them playing together rather than the demos. “Glenn [Tipton, guitar] originally wanted to work on it like they have done on the last few albums and use the demos as templates and work off that, and I made them actually play as a band. According to Sneap, “Rob did great” during the album’s final recording sessions. “I’ll tell you what: for someone who’s got that much experience, there’s no ego there at all,” he said. “We’d do, like, six or seven passes, and I’d ask him to try something a bit [different] on this part, and he was, like, ‘No problem.’ And he’d give me another four takes with a slightly different vibe. And then me and Tom Allom would sit there and we’d comp it, and we pretty much agreed on everything. “And the other thing… What Rob‘s really good at is harmonizing with himself,” he continued. “And Tom‘s really good at… I didn’t realize how much the classic PRIEST albums, a lot of the harmony ideas were Tom Allom‘s influence. So Tom was there, and because he’s a keyboard player, he’d be singing harmonies to Rob, and Rob was nailing the harmonies like that. Sneap went on to credit Tipton for being the creative mastermind behind JUDAS PRIEST. Allom produced every PRIEST release from “Unleashed In The East” (1979) through “Ram It Down” (1988), along with several live records since then. As a young engineer, he also worked on the first three BLACK SABBATH records under producer Rodger Bain. “Redeemer Of Souls” was released in July 2014. The follow-up to 2008’s double-disc concept album “Nostradamus” was billed as a return to JUDAS PRIEST‘s heavy-metal roots. “Redeemer Of Souls” sold around 32,000 copies in the United States in its first week of release to land at position No. 6 on The Billboard 200 chart.